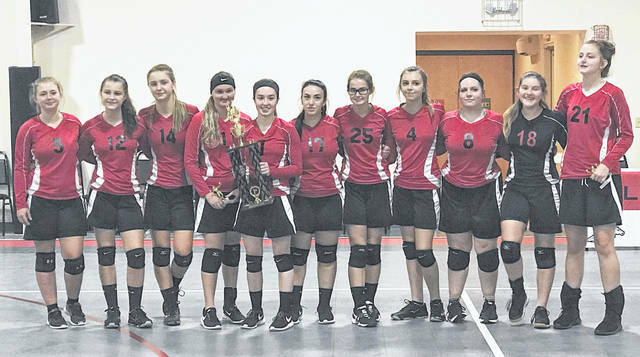 Pictured (L-R) Hayley Throckmorton, Brya Labig, Tara Burns, Lizzy Pierce, Hope Wyckoff holding trophy, Kiara Clark, Hannah McIntyre, Brynli Labig, Alisha Copley, Kelsey Storer, and Aubry McIntyre. This past Saturday, September 15, was the second annual Hillsboro Christian Crusaders volleyball tournament. Three other teams participated in the tournament:Emmanuel Baptist Christian School, Ross County Christian Academy, and Germantown Christian School. In the first game of the day, HCA faced off against Emmanuel. The Crusaders started slowly but they pulled it together winning the first set by a score of 25-18. In the second set, they picked up where they left off as they finished off EBCS 25-9. In the second game of the tournament Ross County Christian defeated Germantown Christian. The spectators could tell right away that this game was unbalanced as RCCA swept the ladies from Germantown in two sets. The third game was an elimination game between EBCS and GCS. The Crusaders from Emmanuel took the first set and it looked like they were going to send their counterparts back to Germantown but a late rally in the second set salvaged any hope GCS had of winning the tournament. EBCS came out strong in the third set and appeared to be finishing off GCS but they fought back and tied it at 23 before losing 27-25. The fourth game of the day was Hillsboro Christian versus Ross County Christian. HCA owned the whole game, sweeping RCCA with scores of 25-18 and 25-16. The fifth game of the HCA tournament had Emmanuel facing Ross County. This game was clearly a mismatch as RCCA took care of EBCS sweeping them in two sets moving them on to the championship game against HCA. The sixth game of the day saw some familiar faces as the Crusaders of Hillsboro tried to win their own tournament by defeating their counterparts from Ross County again. yed all day as RCCA gave them a run for their money but came up short in both sets played. HCA won with scores of 25-22 and 25-23, giving them the championship. Winning the tournament Saturday was the host, Hillsboro Christian, as they did not lose a set all day. Consequently, they are tournament champions two years running. Second place was awarded to the Eagles from Ross County Christian. In third was Emmanuel Baptist. And, the fourth place trophy went home with Germantown Christian. Each team in the tournament had two all-tournament players selected by their coaches. The two all-tournamen players from Germantown were Clara Jerman and Laura Begley. Emmanuel’s all-tournament players were Faith White and Lily Day. All-tournament players from Ross County Christian were Livia Wisecup and Jade Zickafoose. The two all-tournament players from Hillsboro Christian were Lizzy Pierce and Aubry McIntyre. The tournament MVP was Tara Burns from Hillsboro Christian. This story was written by Josh Graybeal and submitted by Leone Bihl.